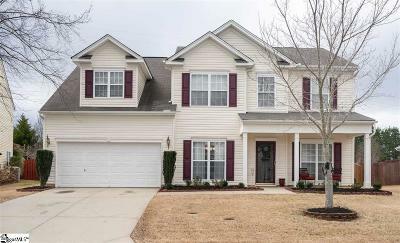 Most Desirable location in Simpsonville! As you walk in the front door you are greeted with beautiful hardwood floors, high ceilings, crown molding, and plenty of sunlight from all the windows. The kitchen has sliding glass doors that lead to the backyard patio for grilling out with family on those warm summer days. Spacious den giving you plenty of room for a large family or an evening with friends. There is a bedroom with half bath on the main level for guests that come visit. The master bedroom is well appointed with high ceilings, pristine tile floors in the bathroom, large walk in closet , Jack and Jill sinks. Two more additional bedrooms with another Full Bath with tile floors! ! Large bonus room which could be used as another bedroom with a walk in closet and 3 separate storage areas. Call and set an appt if you are looking for a home that has plenty of space, loaded with options, in a quiet and safe neighborhood, that is near all the stores, and in an area with top schools, and Move In Ready!